Nag Champa corresponds with the element of Water and the Moon; sandalwood is a significant aspect of this rich aroma therefore it has similar associations. The Champa flower which gives this herbal blend its floral essence is of the Magnolia family. 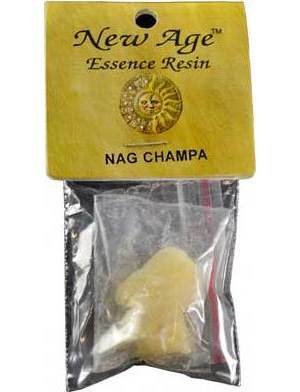 Protection, purification, exorcism, healing, spiritual awareness, mental clarity, and meditation as well as evolution, high vibrational energy, balance, harmony, and peace are affiliated with Nag Champa. May also reduce the influencing energy of addictions and obsessive behaviors while restoring strength to the body, mind, and soul. This is a 5 gram package of resin that may be burned as is upon charcoal, ground and combined with other powders, as well as added to sachets or other magical workings.